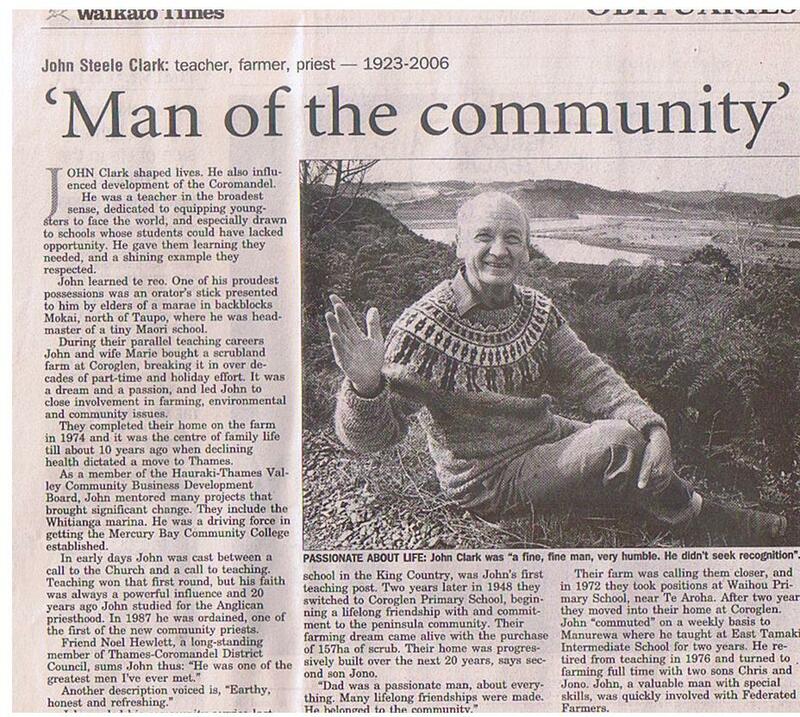 In 16 minutes it will be the 8th anniversary of my Grand Father, John Steele Clark’s death. He was a wonderful and inspirational person. The Greatest human being I have ever known. 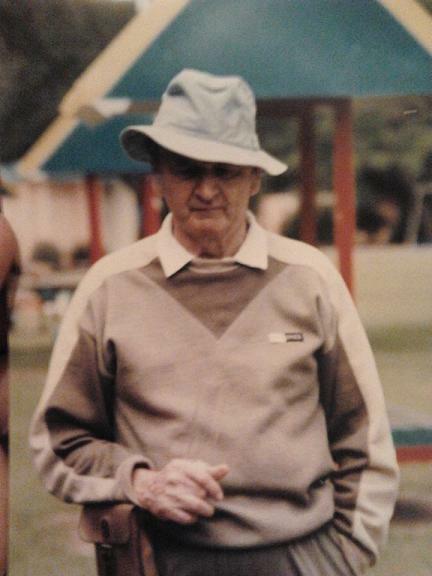 I was blessed beyond measure to have him as my Granddad. I have not seen my own father since I was 5 years old and yet this loss was greatly mitigated by my Grandfathers Love and guidance. I miss him, and still reverence his memory. When I knew his time was short I did something a tad different. My tribute was very controversial as it was *My take* *My perspective* rather than simply a concise record of his exact doings and faith. That was another reason I sent it to him… to see if he would discuss what I had written. We never did discuss it, and so I took that as a Tacit endorsement! 🙂 And this was important to me because I expected some of my family members to not be that impressed with my Rendition of things. Thus with my Granddad’s anniversary in mind I have typed out my Tribute to him and posted it below. I hope to post more about this wonderful man in the future. I also hope my tribute is of benefit to people struggling with the Pains, trials, and tribulations of Life as this is not just the story of an individual’s life but about Hope and happiness in the face of death and loss. I have started a Facebook page in memory of Him >>>Here<<< I hope everyone who knew him visits, enjoys, and contributes to this memorial. My Granddad. 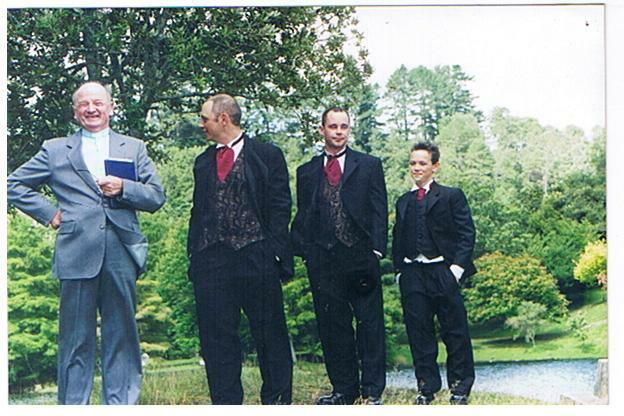 (Left) Married Me to my Wife Joy at Mclarens Falls Tauranga. March 2002. Man of Faith and Reason. A Christian view of Life and Death. After an exemplary life, and a heroic fight against cancer, by beloved Grandfather has passed on. There is not enough time today to fully express what he means to me, I therefore shall leave much out of this tribute for others to share. I have chosen to focus on the most precious values that I personally treasure… that I see as the Greater part of his legacy. My Grandfather was the Abraham of our family! When I was growing up his word was Law. He set the standards for manhood and he always stuck to his word. His glory as a faithful husband to my Nana and as a father to his children (and Grandchildren) gave me such assurance that life makes perfect sense, and that all is well in the world. 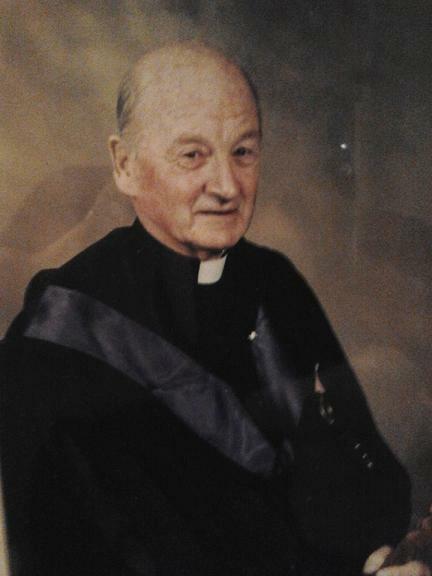 Rev Clark was a man of Reason and a man of Faith. He was a Christian minister, which is a huge testimony to the value of that religion. Those who knew him and loved him, yet are not Christians ought to pause and contemplate the huge implications that such a man of great wisdom and integrity was not ashamed to wear the garb of a Man of God! It is this truth that I hold dearest about my Grandfather, and it is in honour of his principled faith in God that I wish to write to you about life, religion, and death. This is a fitting time to talk about religion and death. If it’s not cool to talk about religion and death at the funeral of a preacher, then I ask when? For many Death is the hardest most frightening reality we face. How are we to deal with it? We all must face our own mortality sooner or later and worse still we must face the mortality of those we hold dear. Should we die from our own immorality or foolishness we may find small solace in seeing such deaths as justly ‘reaping what we have sown’, yet often death comes to the virtuous and innocent…at the hands of some evil, and so this rule appears violated. The Soul that looses a loved one in such a way, or they find themselves facing an early death by some evil is in danger of becoming bitter and twisted, and a hater of God, even if they don’t believe in him! Indeed they choose not to believe in him simply because they see life as unjust! It is for this reason that a positive philosophy about death is essential for every one of us if we are to truly enjoy life. Without a sure reasoned faith powerful enough to overcome these sorts of pain… bitterness and hatred of God are almost as sure to consume your soul as the sun will rise tomorrow! Perhaps some may delude themselves into being happy by such base notions that ultimately ‘Nothing really matters’, but this can never suffice the deep hearted. This can only leave you cold. I therefore say True Religion is essential for the survival and happiness of everyone of us, and not to have such a faith is a disaster! Pain bitterness, hopelessness, and hatred are the lot for the lost soul without true religion. Rev Clark Knew this, and this was one reason he was a minister of God. Peace, hope, and a clear sense of justice are only possible for the man of reason that has reason enough to have faith that ultimately all is well and that life has real meaning and value. It is my testimony, and that of my Grandfather that reason enough does indeed exist for hope and belief in Divine Justice. Tears. Knowing time was short. 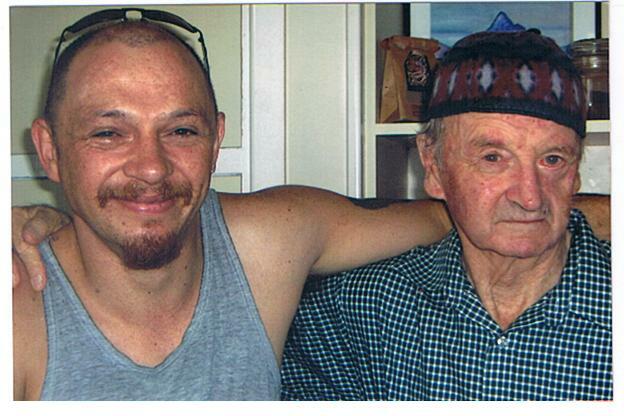 Me and Granddad shortly before his death. Let me now share with you a tiny fraction of the logic for faith in God, faith in his goodness, and faith in Christ by a few self-evident truths. What lies in that box is not my Grandfather! That dead body is but the house he lived in. Science tells us that we replace every cell in our body every seven years. This being so, most of us have had many bodies in our lifetime already! They are miraculous things that were designed by incredible genius, but they are not the essence of who we are. What is missing from that corpse is the *Real Granddad* whom we all love! A great portion of Mankind are suffering from the delusion that we are but soul-less matter. This is a great inhuman and evil superstition that has the most evil consequences for those under it’s spell. The fruit of it is nihilism and this lowers man down to the level of a germ. Granddad knew this truth and was a minister of men’s *souls*. Now think about love… what is the chemical formula for that? Can robots be conscious of their own existence and care about the existence of other robots? The man of reason and science, who holds that good and evil have objective reality must say no! There is no Atheistic science that can accommodate the facts of reality or human experience! All human invention is childlike when compared to such marvels as the human mind, brain, and hands. The scripture that declares we are made in God’s image is the most rational statement pertaining to our existence! I say that if the Earth was like the moon, and there was no such thing as mankind… then it might be rational to think ‘there is no God’ or that whatever is responsible for existence is dead not living. But we live!… and science has proven that Life only comes from life. It therefore follows that whatever is primary in reality must not only be alive, but also of supreme intelligence. We call this Supreme being God…. who is before all temporal Laws and things. The scripture wisely declares “The fool hath said in his heart there is no God”, and that mankind must beware ‘science falsely so-called’. Don’t be deceived by *Fake Science* like Darwinism. Understand the difference between science proper, and poor speculations that are contrary to it. Darwinism is fatally flawed and already fading away, yet Christianity stands fast and ready for you to embrace. It alone accounts for cause and effect, both Physical and Moral. The foolish man builds his house upon the sands of man’s ever changing myths. The wise man builds his house upon the rock of God’s sure word of truth, The King James Bible. This article appeared in the Waikato Times. Why must we embrace Christ? It is because this is how God has declared as his only acceptable way of salvation, and it is God who sets the terms for such a thing… not us. To be so vain as to believe God must accept us on *our terms* is to hang reality on our whim, and to Deify our pea-sized intellect! Socrates, who believed in life after death, said it ought to be a man’s chief concern to ‘Know thyself’, and that the unexamined life is not worth living. I say that if we dare to examine ourselves our need for Christ and God’s forgiveness becomes as clear as day! What is wondrous about God’s salvation through Christ is that he has managed to satisfy both Justice and Mercy, and to reveal his loving grace towards us. He has achieved this by giving us freewill, and the liberty to choose to or reject him. For us to choose Christ we must recognize we are sinful and lost. Sin and Evil are the cause of these and knowing this ought to convince us all of the need for salvation and God’s government! Salvation is a free Gift! The Bible says Abraham believed God and it was counted to him for righteousness. Rev Clark believed in God and was a minister of this truth. Was he an irrational superstitious Fool? He was a man of Reason and a true Humanitarian. This is what Christianity is all about! I don’t ask you to become a pew warmer. I implore you all to ask Christ to be your savior! Let us maintain our faith in justice in the face of every hardship. Let us play the hand we have been dealt with dignity to the very end. Let us love one another and cherish every moment we have! I thank God for my Grandfather and trust his soul is now in a much better place. And I expect to see him again! Thank you Granddad for everything. I cannot finish without giving recognition to my Nana who is the best wife any man could have. Thank you Nana for loving and caring for my Granddad. We all love you so much! St Paul. 1 Corinthians 1vs18. I picked this song because it is one Me and my Family used to enjoy at Christmas time and on visits to Granddad and Nana…. Priceless memories.